Offshore: Winds Of Change Or A Storm To Weather? Jeffrey S. Pyle is the President of Seaway Navigation and Tours. He holds an electrical engineering degree and has worked on numerous U.S. Navy engineering projects including the Seawolf and LCS programs. 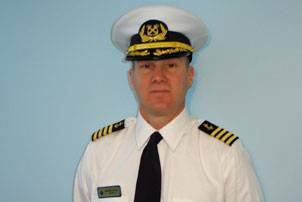 He is an active Master of Near Coastal vessels with more the 15 years of experience across the Great Lakes and Atlantic seaboard. Contact Pyle at jeff@seawaynavigationandtours.com. From the July 2010 edition of MarineNews. With all the activity in the offshore and inland markets these days there is a ray of hope for operators who are willing to adapt to the changes that are coming. As mariners, we are good at adapting, unfortunately, we’ll be dealing with conflicting governance of state and federal laws and the uncertainty of subchapter status for new vessel types to be designed, constructed and operated in support of the emerging offshore wind energy market. With the emergence of wind power as a viable alternative to electrical power generation, there will be a need to build and operate maritime vessels dedicated to the specialized needs of offshore wind generation facilities. The fleet of vessels will vary in capability, but arguably, the most prolific of these vessels will be those that support the entire lifecycle of these systems, the offshore wind energy support vessel (OSWESV). This is good news for shipyards, maritime operators and individual mariners. However, as with all things in life, there comes a time when the “system” and “process” come into play. If U.S. operators are to succeed in this new market, shipyards, operators, mariners and government agencies need to address two specific questions very soon or the U.S. operators will fall behind and face unnecessary risk and challenge and the very success of the offshore wind energy industry will be threatened. The offshore wind power industry within the United States has been undergoing permitting and preliminary design activity for several years now. There are several projects at various stages of permitting at this time with published construction schedules set to begin within one year’s time. However, a cursory review of the U.S. flagged fleet revealed not a single vessel that has been either constructed or retrofitted to provide dedicated and purposeful support to the offshore wind parks. The development and utilization of the specialized vessels will have a broad reaching economic impact and come at a time when the maritime industry could greatly use the work, and as importantly, a time that the public is increasingly interested in and accepting of alternative energy development. However, there are two specific questions whose answers will have significant impacts on the cost of construction and operation of these highly specialized craft: (1) under what subchapter(s) of 46 CFR will the vessels be classified and (2) will the operation fall under state or federal jurisdiction? After several discussions with representatives from the USCG, there is uncertainty as to which sub-chapter OSWESV’s would be classified. Should they be subchapter L boats? Will they be subchapter I boats? Subchapter D boats? Or will these vessels be required to have multiple subchapter certifications? The basic premise stated for subjecting OSWESV’s to subchapter L is 46 CFR § 125.160 (4) which includes a vessel that “Regularly carries goods, supplies, individuals in addition to the crew, or equipment in support of exploration, exploitation, or production of offshore mineral or energy resources.” Historically the vessels supporting these activities require significant quantities of lubricants, expendables, etc. which formed the basis for creation of this classification. The pressing of subchapter I classification on these vessels could be rationalized since they may be carrying materials in pre-packaged units for use on turbines. Nevertheless, they most likely will be carrying a moderate amount of bulk lubricants for replacement of exhausted lubricants and will be transporting these exhausted lubricants back to shore in a fashion similar to a utility vessel. This may mean that these vessels will also be subjected to subchapter D requirements. While the full Concept of Operations (ConOps) documentation for wind park maintenance are still undefined, it is a far stretch indeed to think that the same type or quantity of expendables/lubricants as a subchapter L or D will be used in wind park maintenance or the magnitude of cargo as a subchapter I vessel will be carried. With this purpose built vessel coming into the market one can see where the industry could become so mired in classification definitions as to render the utilization of existing definitions problematic. Even while the subchapter discussions take place, another equally important issue needs resolution. Will individual state law prevail or will federal admiralty law press its weight? The major concern is not with wind parks constructed within the confined waters of individual states, but rather those planned for coastal waters or federal waterways such as those proposed for the Great Lakes, Long Island Sound or the Cape Wind project off the coast of Massachusetts. The recent litigation over Massachusetts’ legitimacy to press state jurisdiction over commercial oil carriers transiting Buzzards Bay makes this question more than academic. In the several ConOps I have reviewed or developed, the construction vessels and potential support vessels will be transiting federal waterways but performing work on structures and systems which may span across state territorial waters into the contiguous zone and then some other point in the Exclusive Economic Zone EEZ. This conflict between zones and subsequent legal authority for labor standards, P&I, etc. will inevitably lead to legal wrangling and lost time, something that the industry cannot afford. There are arguments to be made for state jurisdiction over fixed structures in state waters, but this logic can become convoluted and confusing when one crew may be servicing a tower in a state’s waters, another crew operating in the contiguous zone and yet another in the EEZ. A vessel captain has enough to worry about without wondering if the bow of his ship is in state waters offloading personnel but the stern is in the EEZ. This intertwining of state authority and federal law in maritime operations cannot be a good thing for anyone other than lawyers. This confusion and conflict will consume valuable time and resources all to the detriment of the project. In the end, the mariners, owners, and builders will design, build and operate vessels that will serve the emerging industry well. They will do so in a timely fashion that suites the needs of the business involved and cooperate to ensure that every stakeholder is rewarded and that progress is made. Let’s hope that the legal issues and the “system” don’t impede progress.